The need for robust cyber security solutions and network performance management & optimization solutions to efficiently manage today’s complex networking environment in compliance with the standards and regulations are some of the driving factors for the deep packet inspection and processing market. The data loss/leak prevention and management is one of the fastest-growing application based on deep packet inspection technology. DLP techniques have evolved from reactive protection to proactive protection-based model, making it addressable to the latest technologies and trends such as Bring Your Own Device (BYOD), mobile device penetration, and ever growing sophistication of data breaches and Advanced Persistent Threats (APTs). Other growth factors of DLP techniques are increasing need of data loss security in corporate arena, Growing trend in BYOD, and need for filtration of data at rest on the corporate network are some of the driving factors for the adoption of DLP applications. Network performance management and optimization solutions are intensively used in this sector to ensure improved Quality of Service (QoS) and Quality of Experience (QoE), which makes this sector the highest contributor in the deep packet inspection and processing market. Factors such as continual growth in the mobile network, increasing complexity of business, unregulated nature of internet, and growth in the adoption of BYOD are driving the deep packet inspection and processing market in the APAC region. One of the most innovative developments in the deep packet inspection and processing market is the development of Next-Generation Firewalls (NGFWs) that are capable of inspecting the network packets up to layer 7 (application layer) of the OSI model using deep packet inspection technology. This provides powerful network traffic filtering capabilities depending upon the packet contents. Open-port driven attacks, such as Code Red, Nimda, and SQL Slammer worm triggered the need for such application. 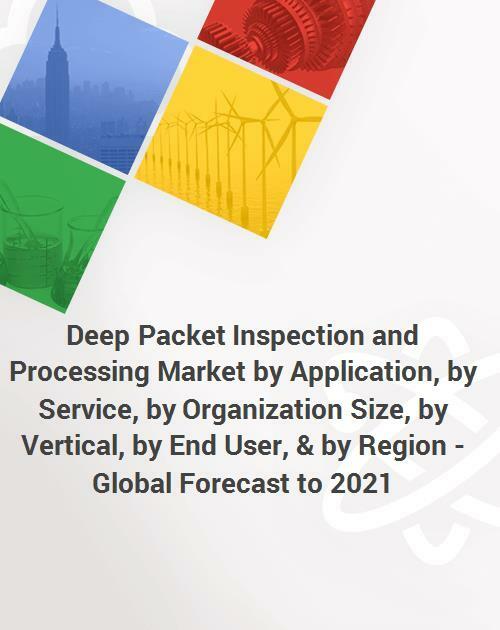 This report segments the deep packet inspection and processing market comprehensively and provides the closest approximations of the revenue numbers for the overall market and the subsegments across the different verticals and regions. This report will help stakeholders to better understand the competitor and gain more insights to better their position in the business. The competitive landscape section includes competitor ecosystem, newproduct develpoments, partnerships, and mergers and acquisitions. 13.6 Palo Alto Networks, Inc.
13.8 Blue Coat Systems, Inc.
14.2 Huawei Investment & Holding Co., Ltd.
14.5 Lookingglass Cyber Solutions, Inc.